As I near my New York Road Runners finish line after almost two decades with the organization, it is time to reflect on the miles traveled. 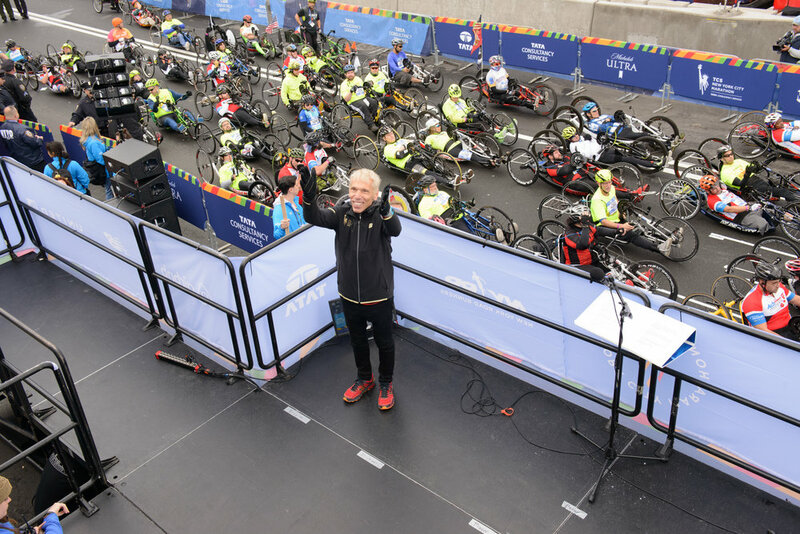 It has been my honor and privilege to serve as President of Events at NYRR and the Race Director of the TCS New York City Marathon, and to be part of so many NYRR runs, walks, and wheelchair journeys. Whether watching someone complete their first race or greeting elite athletes at the finish line of the TCS New York City Marathon, there have been so many wonderful experiences. I’ve especially enjoyed getting to know the runners and being part of their achievements, celebrating with many from the first to the final finishers. I am very proud of what we’ve been able to accomplish during my time here, and proud of being able to continue the stellar accomplishments of this organization, respecting and honoring its 60-year history, always with a nod to those who came before me. My focus early on was to find ways to build NYRR’s events into more of an “experience” for the runners, the spectators, and the entire city. The marathon, being our crown jewel, is where I initially focused my energies. From the creation of our Olympic-style Opening Ceremony, to the Saturday morning Dash to the Finish Line 5K, we expanded from a one-day race into a week-long celebration, the result being a crescendo of excitement and anticipation that hits a frenzied peak at the blast of the howitzer on the Verrazzano-Narrows Bridge. The New York Road Runners calendar offers over 50 races yearly, and each one deserves a level of production and operational excellence that will deliver a safe and fun experience. My position afforded me the opportunity to reimagine how our calendar of events could be produced. We broke new ground with the Brooklyn Half. By taking a small-scale race and reversing the course to finish in Coney Island, moving the date to jump-start the summer season, and adding a multi-day pre-race festival that featured a borough-centric collection of artists, musicians, DJ’s, and food vendors, the event became one of our most popular with over 27,500 participants, solidifying its standing as the largest half marathon in the United States and a key element in the resurgence of the Coney Island business community. For years we dreamed of the day when American marathoners would stand on the podium at the Olympic Games and in the winner’s circle at major city marathons such as ours. To get to that end we encouraged, supported, and believed in our nation’s runners. More importantly, we gave them the platform to race on the world’s biggest stage against the greatest athletes. Through the years we have hosted championship performances on the streets of New York City by Shalane Flanagan, Meb Keflezighi, Ben True, Molly Huddle, Matthew Centrowitz, Deena Kastor, Bernard Lagat, Jenny Simpson, Brenda Martinez, Dathan Ritzenhein, Ryan Hall, and many others. We are committed to supporting elite athletes with an opportunity to compete in a major market with an international broadcast that reaches millions. We ask only one thing in return—that the athletes run clean. NYRR has led the industry with anti-doping policies and recently elevated our fight against the use of performance-enhancing drugs with the initiation of “Run Clean,” a comprehensive clean sport initiative. Through advocacy, education, and a broader testing program, we have galvanized the professional and local elite running community’s support. I have made it clear that there is no tolerance for cheaters, and if caught (at any event) those runners will never be invited to compete again at any NYRR race. NYRR has established itself as the premier community-based running organization in NYC through our free programming in schools, senior centers, and free 5K runs in under-served communities. We have welcomed more children, women, and athletes with disabilities, including launching our Rising New York Road Runners Wheelchair Training Program. None of this would have been possible without the dedication and tireless efforts of the NYRR staff, whom I am so privileged to work with each day We have been fortunate to have many great partners and blessed to have a very special friend in the Rudin family. I also need to thank the many city agencies I’ve partnered with over the years—the NYPD, FDNY, NYC Parks, and many others—as well as The Honorable Bill de Blasio and former mayor Michael Bloomberg, who were and are ardent supporters of NYRR, giving us the opportunity to make the city our venue. It has been a wonderful run. Whether you’re out for your first mile or racing for the TCS New York City Marathon crown, whether you’re participating in our senior programs or joining our Team for Kids, we’ve shared so many good miles together. I trust that I have not disappointed those who have gone before me or our runners in carrying on this mission with equal professionalism, courage, and passion. I thank one and all for allowing me to be part of your running lives.